GeorgiaInfo, the state’s online almanac based at the University of Georgia, launched a redesigned website Jan. 21. GeorgiaInfo is part of the Digital Library of Georgia, and is hosted by GALILEO and the University of Georgia Libraries. GeorgiaInfo was created in 1996 by the UGA Carl Vinson Institute of Government. In 2008 the site became a part of the Digital Library of Georgia and GALILEO, the state’s virtual library. “The redesigned site contains the information from the previous site, but in an updated, more visually appealing format. It also is designed to work well with the technology available today – GeorgiaInfo should display equally well on desktop computers, laptops, tablets, or phones,” said Sheila McAlister, director of the Digital Library of Georgia. 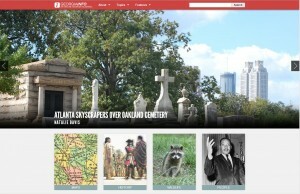 The new site is highlighted by a revolving photo gallery on the home page; it will feature six rotating images showing the beauty of Georgia. The images will be changed regularly. Navigation throughout the site is by “topics” and “features” listed on drop-down menus at the top of each page – each of these links will take the reader to a page with information about a specific aspect of Georgia – history, maps, counties, wildlife, etc. There are 15 topics and 12 features, plus pages with basic information about Georgia and recent updates to the site. There is also a search function available on the navigation bar at the top of each page. The four columns below the photo gallery on the home page will highlight some of the most heavily used or timely topics. These topics will change occasionally, but all of the site information will remain available at all times – through the navigation bar. “Some of GeorgiaInfo’s most popular features have always been This Day in Georgia History and This Day in Georgia Civil War History. Both of these features – with the same information in a new format – are located at the bottom of the home page, and are also listed under features in the navigation bar,” McAlister said.